Taking care of a dog isn't easy, but when you bring your puppy home it's exciting! It also means responsibilities increase, too. Your puppy IS a baby and will need training, love, commitment and time. Your pup can come home when he is 8 to 10 weeks old. 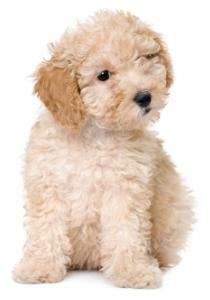 Sometimes toy poodle puppies can't be brought home until they are 12 weeks old because they are too tiny. A day or two after your pet is home, you'll need to visit the vet for an examination and maybe some shots. Caring for a puppy means being proactive with her healthcare. Poodles live anywhere from 10 - 18 years. Holly lived to be 16 years old. That's 10 to 18 years of daily responsibility for your pet's needs. 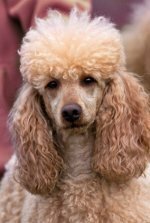 Toy poodles have an average life span of 15 years, miniatures 13 years and standards, 10 years. Taking care of a puppy means, on a daily basis, your poodle needs walked, fed, put out to potty and brushed. You'll have to have a bed for her to sleep, toys, bowls for food and water and food. You'll have to make trips to the grocery store for her food. And, don't forget monthly grooming (washing and clipping). It's a responsibility that goes on all during your pet's life. To start off right, keep your pup outside to potty once you get home. Once she does, pet and say "good girl" so she knows she did right. Take her inside to explore a little, then put her in her crate or bed as she'll be tired. The first day and night your poodle pup is home is a big adjustment for both you and the puppy. Your puppy is going from living with her mother and littermates to being in a strange environment around people she doesn't know. With time, love and patience, she will grow in to a secure and loving family member who will be a lifelong member of her pack.